This is odd. It’s Saturday night and I’m not at work. That hasn’t happened in a couple years. Somehow, I got tonight off because I worked on Monday. Usually when that happens I get a random Wednesday or Thursday off in the middle of my work week, but this time, my employer decided to be nice and give me a long weekend instead. A couple weeks ago, my parents had asked about coming up to Kalamazoo with my brother and his family. The plan was to stay at the Holiday Inn on 11th Street and hang out on Sunday. We didn’t do it because J had plans the night they were talking about coming. Once I realized I had a rare Saturday off, I asked if they wanted to come hang with us this weekend. After a day of playing at the Oshtemo Township Park and swimming at the Holiday Inn, we headed to Burdick’s West for dinner. We played in the Holidome for a little while longer before J and L needed to go to bed, so we headed back home. Once I got home, I got a text from my brother asking if there was anything we could do. His girls were wide awake. My mom, sister-in-law, and two nieces ended up going bowling at Holiday Lanes, but my dad wanted to play mini golf. I haven’t done that in years and didn’t even know a place in Kalamazoo…..good thing there’s Google. My dad, brother, and I ended up at Putters Family Fun Center on South Westnedge in Portage just south of the intersection with Romence Road. The complex has several things to do. 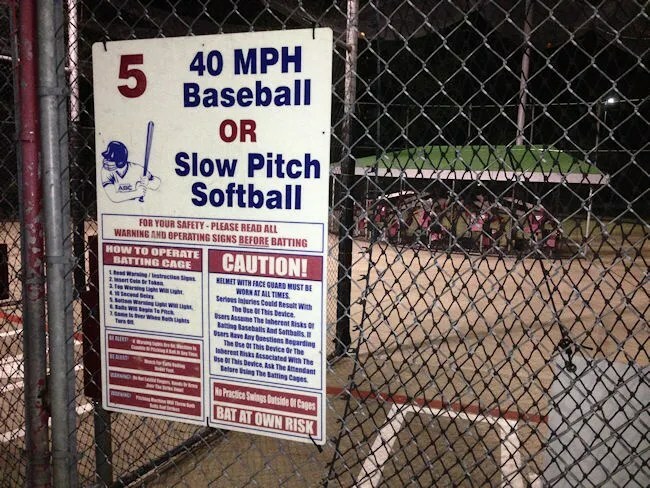 Mini golf, batting cages, and video games among other things. The parking lot was pretty empty, but we were getting there about 9:00 on a Saturday night. Most of the other patrons looked like they were high schoolers on dates. We walked in to the main building which brought us into the arcade. We sort of looked around to see where to go for mini golf then I noticed a sign pointing us to a door leading outside. 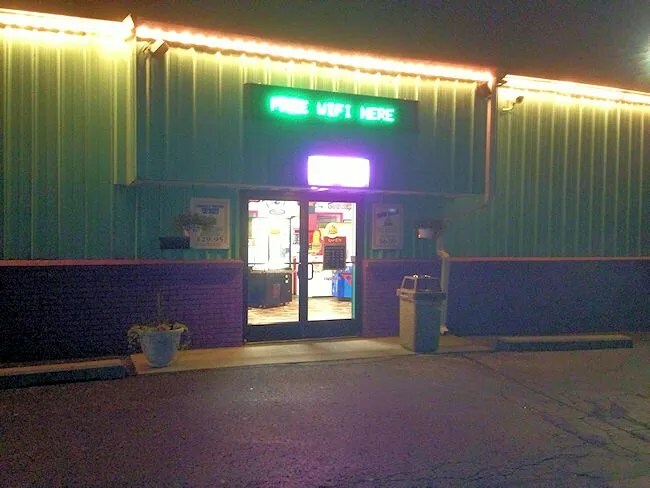 Once outside, we found another counter where you could pay for all of the outside activities. It took a while…and my brother going inside to find someone…for us to actually get someone out to the “clubhouse” so we could pay. There are two mini golf courses at Putters and we decided to play both. The fee for all three of us to play 36 holes was $24. We paid cash, grabbed a putter and a couple balls and headed to the first course. Neither course is incredibly difficult. Most of the hazards are rises and dips in the terrain. I’m more of a fan of the mini golf courses with obstacles and Putters doesn’t have a lot of those holes. It was still fun. My brother is pretty competitive and didn’t like the fact that I was nonchalantly competing with him on the second 18. The first 18 he beat us both pretty bad…actually making three aces. Once we got to the end of the second 18, my brother and I both walked over to the batting cages. We both played a lot of baseball growing up and spent a lot of time in similar cages back home in Illinois. I think we both really wanted to get in and see what we could still do, but were both afraid of embarrassing ourselves. After dropping our balls in the fall hole and tallying up the final score, we decided to just head home. 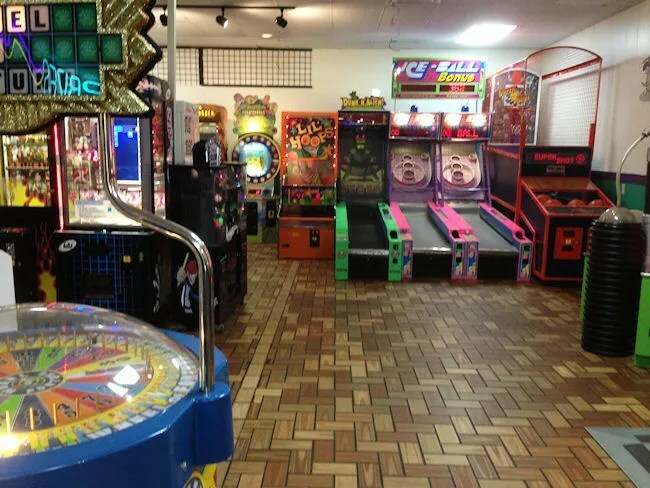 I was tempted to play some skee ball, but it looked like the employees were starting to clean up and get ready for closing time. 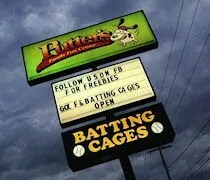 In a little side note here, I know this blog is typically about food and I totally ignored the food at Putters. We had already eaten and it was pretty late when we got there, but they do have 14″ pizzas as well as pizza by the slice for sale at a small concession stand like area. There are a couple booths in a small dining area so you really can make a day out of it with the kids. 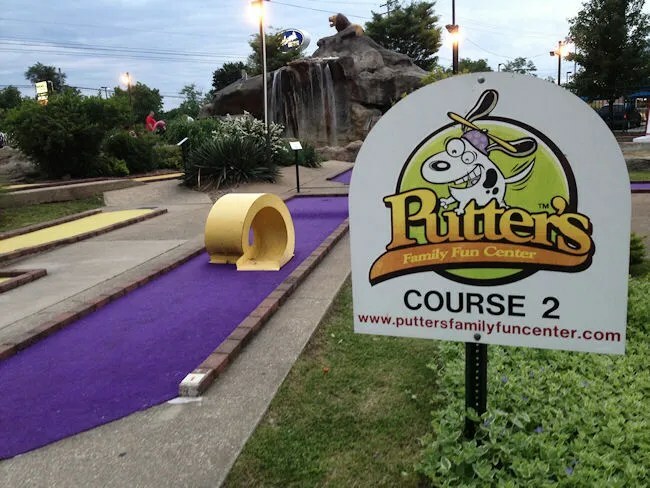 Putters Family Fun Center reminds me a lot of a place back home where my family spent many weekend afternoons and it became a spot where my friends and I would hang out on Friday and Saturday nights once we got our drivers licenses. It’s the perfect place for those awkward teenage dates as well as a place to bring the kids to burn off some energy. The three of us had a pretty good time with just a little bit of a golf competition……and I lost….